We’ve heard a lot of great stories from Arlingtonians who have dusted off their bikes and have realized the positive impact bicycling has had on their health. Here’s some info we found while researching the health benefits of bicycling, the impact bicycling can have on a community, and how it relates to Arlington’s Hike & Bike plan. The plans will improve community members’ health by encouraging more walking and bicycling. The Centers for Disease Control (CDC) reports that improving places to promote more physical activity could result in a 25% increase in people who exercise at least 3 times a week. Childhood obesity is a problem in our country, and Arlington is no exception. The Hike & Bike plan’s goal of getting involved with the national Safe Route to School program, which provides guidance on increasing walking and biking to and from school, would improve children’s health. —Lincoln, Nebraska. April 2005 journal, Health Promotion Practice, : Cost-Benefit ratios: for every $1 invested in trails for physical activity, people realized a $2.94 savings in their health care costs. –a Norway study found an even higher benefit to cost ratio from hike and bike infrastructure: for every $1 invested, people realized a $4 to $5 savings in reduced health care costs. –a UK study found that the average benefit to cost ratio for walking and cycling infrastructure in the U.K. and in other European countries was 13 to 1, and in the U.K. alone, it was 19 to 1! That is for every $1 invested in biking and walking improvements, people in Europe saved $13 in health care costs, and people in the U.K. saved $19 in health care costs. U.S. Dept. of Health and Human Services, Centers for Disease Control and Prevention, “Guide to Community Preventive Services” (2002), cited in Hike and Bike Plan, Chapter 1, page 1-5. Saelensminde, Kjartan. “Cost-Benefit Analyses of Walking and Cycling Track Networks Taking Into Account Insecurity, Health Effects, and External Costs of Motorized Traffic,” Transportation Research Part A, Vol. 38, (2004) pp. 593-606. New BFA Supporter – Health & Harmony Coffee House & Cafe! Please join us in welcoming Health & Harmony Coffee House & Cafe as a new BFA supporter! Health & Harmony Coffee House & Cafe is a new arrival to downtown Arlington, with a full espresso bar, great food, and various classes from yoga to wood carving. Plus, they have graciously agreed to provide a 10% discount (on food and beverages) for all customers who arrive to their shop by bicycle! Ride on by and check them out today! Check out our BFA Supporters Map! More walking and bicycling infrastructure will STRENGTHEN our LOCAL ECONOMY. And that’s not just a good thing. It’s a GREAT thing! Outer Banks, North Carolina: 2004 Study of the Outer Banks in North Carolina commissioned by the North Carolina Department of Transportation found that the $6.7 million in public funds spent to add wide paved shoulders to roads in the region and to construct off-road paths generated an estimated $60 million annually. In other words, for every $1 dollar invested in bike infrastructure, that community generated almost $9 in economic value to the community. + motor vehicle traffic volumes were maintained at the same level. + restaurants were busy and more were opening. Emily Drennan’s study (2003) (San Francisco St. U.) “Economic Effects of Traffic Calming on Urban Small Business,” surveyed small business owners/merchants on the effect of bicycle lanes on Valencia Street in the Mission District in San Francisco, and 65% said that bike lanes had a generally positive impact on business and/or sales, and they would support more traffic calming on the street. +Trust for Public Land (“Economic Benefits of Parks and Open Space,” 1999) (Chap. 1, p. 1-7). +In a survey published in 2002 by the National Association of Home Realtors and National Association of Home Builders, trails ranked as the 2nd most important amenity out of 18 choices. 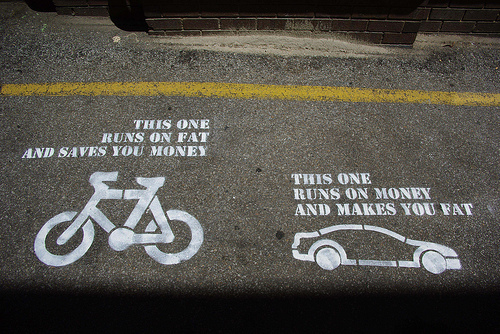 HIGH GAS PRICES make bicycling an even better option to reduce household expenses! This frees up household income that can be spent in small businesses in Arlington! The Hike and Bike plan identifies some Top Priority projects, in Appendix C of the plan, estimated to cost around $16 million. But note that the on-street bikeway portion of that cost is ONLY about 1.7% of the cost of all the hike and bike projects (around $278,669, spread out over 3 years, or, $92,890 per year). $12.173 million of the $16 million is for off-road greenway/linear park projects not on city streets. These are the projects that opponents say they support (and we thank them for their support!) and these projects are the bulk of the expense. They can be funded by linear park fees. Sidewalks account for the remaining cost: $3.551 million. No road maintenance funds will be used for these projects. connecting existing facilities, serving the underserved, improving safety where needed, and pursuing lowest cost facilities first. routes where existing right of way is adequate and work involves painting stripes or restriping or road diet, not new construction. North Carolina Department of Transportation, Division of Bicycle and Pedestrian Transportation, “Pathways to Prosperity: The Economic Impact of Investments in Bicycle Facilities, A Case Study of the North Carolina Northern Outer Banks, http://www.ncdot.gov/bikeped/researchreports/ and http://atfiles.org/files/pdf/NCbikeinvest.pdf July 2004. (Lindsey et al., “Property Values, Recreation Values, and Urban Greenways,” Journal of Park and Recreation Administration, vol. 22(3), pp. 69-90), Fall 2004. Hike and Bike Plan, Chapter 1, page 1-5. (Source: FY2011 Adopted Budget & Business Plan p. 137). S.O.S. Arlington Update #19, Posted December 8, 2010. Hike and Bike Plan, Executive Summary, page 9. Hike and Bike Plan, Chap 1, p.1-3; p. 7-3. See Appendix B and C for Top Priority Projects. Success for the Hike & Bike Plan! and the Thoroughfare Development Plan! It could not have happened without all of your support. But now it’s time to really roll up our sleeves and change to a higher gear. We need to focus on the Arlington Hike and Bike PUBLIC HEARING with City Council on March 1st. It’s a whole new board of people who also need to hear our voice. 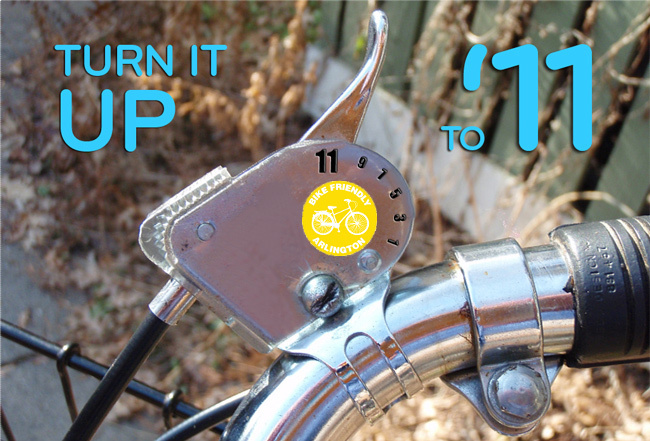 So let’s spend the month turning it up to 11 and really letting the leadership know that bikes belong in Arlington. Everyone’s done a great job so far. Let’s keep it going! Due to the weather, the City of Arlington has postponed today’s scheduled P&Z public hearing until tomorrow, Thursday, February 3rd, at 3:30pm. We know the earlier time may make it difficult for some to attend the meeting, but please do your best to make it out – arrive late if you need to. We need you there! Your email can be as short and simple as you like. If you need inspiration, check out our sample letter. Have fun and stay safe in the ice and snow today, folks! Hope to see you at the hearing tomorrow! Meet at the UTA Engineering Research Building at 4:45 for a short group ride to the hearing, or show up at City Hall at 5:30, or as soon as you can make it. Sign 2 green cards of support (one for the road plan and one for the hike and bike plan) and turn them into the box at the front of the council chambers. Speak in support if you can, thank the commission and staff for all their hard work, and stay positive! If you haven’t had a chance to sign the petition or write city council, please take advantage of this cold day to do so!